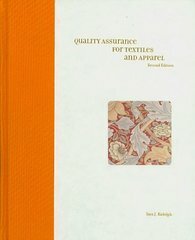 Quality Assurance for Textiles and Apparel 2nd Edition 2 Edition Textile quality assurance is the process of designing, producing, and evaluating products to determine whether or not they meet the quality level desired by a company's target market. Quality Assurance for Textiles and Apparel, 2nd Edition, reflects the industry's best practices for providing products of a consistent quality that meet customers' needs. With updated information on technological advances and globalization, this 2nd Edition emphasizes the importance of incorporating product quality measures from the merchandising and design stages all the way through production, delivery, and retailing.